Our clinic at 45 Lyme Road is an open and sunny office building directly across from Hanover Golf Course and Hanover Fire Station. A number of other medical professionals are also located in the complex and we are conveniently adjacent to the Co-op and nearby the Hanover Richmond and Ray Schools. BE Fit has state of the art exercise and modality equipment and located in an open gym setting with private treatment areas available. We foster a friendly and professional atmosphere for your care. Suite 101 is on the ground floor on the far left side of the building. Please stop by any time to say hello and check out our space! 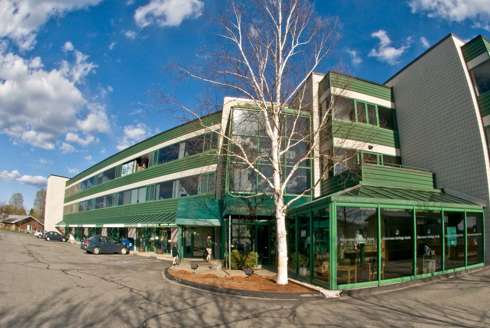 BE Fit at 45 Lyme Road in Hanover is conveniently located just one mile north of the Dartmouth green, 3 miles from I-91 in Norwich. We have ample parking on-site and our building is fully accessible. We are also directly on the Advance Transit Brown line. Take Exit 13 (Norwich/Hanover) and proceed on 10A East/West Wheelock Street across the Ledyard Bridge and up the hill into Hanover. Cross Main street and then take your next left on College Street (this road becomes Route 10). Follow straight through one light 3/4 mile after turn, then proceed one mile and go straight through the traffic circle (taking second exit). Just past the Co-op parking lot will be 45 Lyme Road’s parking lot. Take Exit 18 (Lebanon) off of I-89, and turn to proceed North on route 120. Follow 120 for 3.5 miles and then continue straight on Greensboro Road/Lebanon Street. Bear right at light (road becomes South Park Street) and follow 0.7 miles to a T with Lyme Road/Route 10. Turn right at this light onto Lyme Road, then proceed one mile and go straight through the traffic circle (taking second exit). Just past the Co-op parking lot will be 45 Lyme Road’s parking lot. BE Fit is easily accessible on the free to ride Advance Transit bus system serving the Upper Valley. We are on the Brown Line with schedule to be found here: www.advancetransit.com/brownroute.htm. BE Fit is at the 45 Lyme Road stop, which is between the “Vail DMS” and “Kendal” stops listed on the schedule. There is an official stop at 45 Lyme with a bench and shelter, but let the driver know you would like him or her to stop there as they only stop when needed.